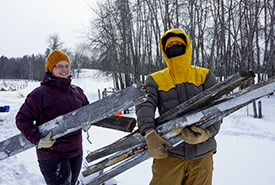 www.natureconservancy.ca > Home > Where We Work > Alberta > Come Visit Us! Visitors are welcome at many conservation areas protected by the Nature Conservancy of Canada (NCC). These special, natural places provide excellent opportunities for hiking, birdwatching, nature photography and other compatible recreation activities. This year, get out into nature. 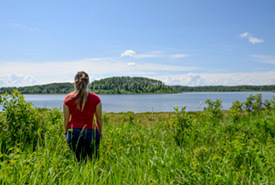 Go to connect2nature.ca for information on visiting our properties in Alberta. We'd love to show you what we are able to accomplish, thanks to the generous support of our landowner partners and donors. Interested in visiting our featured NCC properties across Canada? Click here to access our Nature Destinations sites, which are open for public access, from coast to coast. Nature Destinations feature trail infrastructure and parking while the majority of NCC properties remain wild spaces without amenities. This NCC property is located near the town of Drumheller in the Badlands of Southern Alberta. Check out the amazing geological features of this property, including sandstone, white mud, coal seams, volcanic ash and fossils. To check out this property, click here. Take some time to walk or go birdwatching around the calming waters of Coyote Lake, located on the Hopkins Property. To check out this property, click here. Just a quick drive from downtown Edmonton, Bunchberry Meadows is the perfect place to bring your kids and pack a picnic on a sunny afternoon. To check out this property, click here. Public access to NCC properties is managed on a property-by-property basis, depending on the ecological sensitivity of the property and the level of public interest. 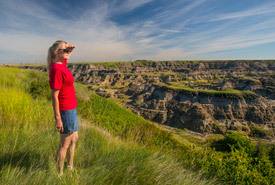 The Nature Conservancy of Canada (NCC) Alberta Region is happy to offer public access to over 80 privately owned conservation sites across the province. Information about these properties is available through our property access website: connect2nature.ca. The online access website provides managed access to NCC properties in a way that preserves the integrity of each property’s unique conservation values. The website ensures all users have equal opportunity to access NCC properties for a variety of uses. Please enjoy these beautiful places! If you need assistance, please email us at connect2natureAB@connect2nature.ca. I understand that during my time on the Nature Conservancy of Canada (NCC) property I may encounter dangers and natural hazards. I agree that I am accessing the property entirely at my own risk. I acknowledge that permission to access is personal to me and those included in my property booking. I understand the online access website provides managed access to NCC properties in a way that preserves the integrity of each property’s unique conservation values. The website ensures all users have equal opportunity to access NCC properties for a variety of uses. I understand these properties are privately owned and NCC monitors the risks associated with public access on an ongoing basis (fire, cattle, sensitive wildlife, habitat destruction etc.). I am aware that permission to access the property may be revoked by NCC at any time, with or without notice. i. Foot access only. The use of motorized vehicles is prohibited on all NCC properties. iii. Fires and smoking are prohibited. iv. Use respect and pack out all garbage. v. Leave gates as you find them. vi. Grazing cattle may be present — do not approach livestock. vii. Carnivore hunting is prohibited (coyote, grizzly bear, black bear, cougar etc.). viii. Construction of permanent tree stands or blinds is not permitted. Temporary/portable structures are permitted but must be removed from the property at the end of the access period. ix. Target practice is prohibited. x. Electronic surveillance devices (trail cameras, drones) are prohibited. NCC properties are privately owned and managed conservation land. NCC properties are not affiliated with Government of Canada or Government of Alberta Crown Lands.